On July 28, 2012, Jonathan, 22, told authorities that his father, Raymond, 48, disappeared into the choppy waters of New York’s Jones Beach. In the days that followed, police launched a massive search-and-rescue mission, but failed to recover Raymond’s body. While his grieving family mourned his death and his wife says she planned his funeral, police received shocking news: Raymond was very much alive and living at his Florida timeshare. Authorities allege that Raymond, who was recently unemployed and said to be unhappy in his marriage, conspired with Jonathan to fake his own death to share a $400,000 insurance payout — and they say they have the e-mails to prove it. Facing multiple felony charges, Jonathan, alongside his attorney, shares his side of the story. And, Jennifer says not only does she have a highly-charged relationship with her mother, Luz, she has no intention of fixing, forgiving or forgetting. Find out what’s at the root of their conflict. Can Dr. Phil bring some peace to this family? Innocent Victim of His Father’s Plot? When Raymond apparently disappeared into the waters of New York’s Jones Beach, his family was devastated. But things aren’t always as they seem; and when Raymond was located a week later at his timeshare in Florida, police say they began to uncover, through e-mails, a conspiracy weeks in the making. Raymond, recently unemployed and said to be unhappy in his marriage, is allaged to have faked his death with help from his son, Jonathan, in an effort to share a hefty insurance payout. Raymond’s lawyer, Brian Davis, says that a childhood accident is behind his client’s actions, and he needs to be in a hospital — not prison. Now facing two felonies and a misdemeanor, Jonathan sits down with Dr. Phil alongside his attorney, Joey Jackson, to break his silence and reveal what he calls the real story. Jonathan says he was abused by Raymond, both physically and verbally, since he was 10 years old, and afraid for his life, he went along with the fraud Raymond orchestrated, which he says consisted of telling his family he had drowned while swimming. “He told me that if I didn’t help him, I would die, and anyone I told about this plan would die as well. I have no doubt that my father would have killed me,” he says. He says he was too afraid to call the police — and only told the authorities the truth when he was in the safety of police custody. Jonathan says he does feel bad for misleading his grieving family into believing Raymond was dead, but says he did it to protect his own life. Raymond denies Jonathan’s allegations. Whom do you believe? 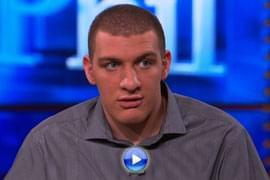 Dr. Phil asks Raymond’s criminal defense attorney, Brian Davis, the tough questions. See the e-mails that authorities say show evidence of planning between Raymond and Jonathan. Jennifer says she hates her mother, Luz, whom she describes as making her physically ill. “If I were to find out that my mom passed away, I would do jumping jacks and [urinate] on her grave,” she says. Jennifer says she never wants to repair their relationship and will never forgive her for what she’s done. She says Luz abused her as a child, told her that her father didn’t love her and made her feel like the scum of the Earth. She says Luz is a “huge manipulator” who has always sided with her sister, Ruth. “My sister and mom work together,” she says. For insurance reasons, Jennifer says she gave guardianship of her young son to Luz, but then struggled for years to get him back. She claims that Luz attempted to keep her son from her, including filing a false CPS report, alleging she sold meth out of her home. Luz says she’s done nothing wrong, and points the finger at Jennifer, saying the two haven’t had a civil conversation in years. She admits that she was the disciplinarian when her children were younger, but says that their relationship has been strained since Jennifer was 13 years old. “Jennifer despises me,” she says. Luz says Jennifer has hit her and threatened to kill her. 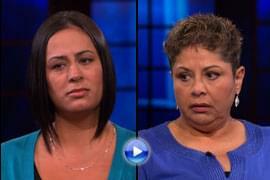 With Jennifer saying she doesn’t want a relationship with her mother or sister, Dr. Phil tries to bring the family peace. Learn how Jennifer’s mother, Luz, gained guardianship of Jennifer’s son — and how Jennifer fought to get him back.